It’s been a sluggish winter for cruise lines trying to sell Caribbean sailings. Consumers have apparently lost interest in tropical islands, shifting their vacation dollars toward the cities and beaches of Europe. However, from February through mid-March, Carnival’s sales suddenly spiked upward, setting records in the company’s sales department, including the highest number of individual reservations on a single day on March 1. What’s Carnival’s answer to soft bookings? Apparently, it’s dirt cheap cruise fares. “Clearly consumers are taking note of the tremendous pricing available right now on our Caribbean voyages and the inherent quality and value of a Carnival cruise vacation,” says Bob Dickinson, Carnival’s president and CEO. Many vacationers put off making travel plans when prices were higher. Now, with rates falling, travelers can’t afford not to book at these low prices. How can you capitalize on this trend? 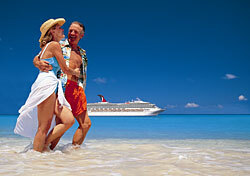 Start looking now for spring sailings, which will be the most heavily discounted voyages. Carnival is having another one-day sale on Thursday, March 22, with prices starting at $249 for three-night cruises and $499 for seven-night cruises. Select cruises will be eligible for upgrades within cabin categories. That means when you purchase a minimum-priced inside, outside, or balcony cabin, you’ll get upgraded to a higher-level cabin in that same category. You won’t be able to move from an inside cabin to an outside or an outside to a balcony without handing over more cash. It’s unclear whether low Caribbean cruise fares are here to stay, or whether prices will rise as cruise line earnings rebound. However, if you’ve got some vacation time, you can’t go wrong with these cheap rates on warm-weather island getaways.